You have heard me talk about my small town experiences, growing up in small time Firth, Idaho, just twenty minutes south of Idaho Falls, Idaho. And as part of that, you have heard me talk specifically about growing up with Star Wars, almost being raised on it. We love talking Star Wars here at The Group Real Estate. I was always up by 6am to get ready for my kindergarten and first grade classes and a part of that was a friend coming down to get on the bus with me. When he arrived, we would always draw pictures of our favorite characters, such as Batman and Raphael. One night I asked if I could stay the night at his house, which was okay’d by mom and dad. That was my very first experience with Star Wars. I watched Return of the Jedi. I fell in love so fast, I opted to go to the library with mom the next day and got as many Star Wars books as I could. Each and every morning, I would draw pictures of Luke Skywalker, Darth Vader, the Ewoks, and Jabba the Hutt. Shortly thereafter, when recording movies and shows to VHS was so much fun and a big deal, mom and dad recorded them from TV. Thus ensued my childhood of watching a lot of Star Wars, playing with action figures of Luke and Han, and drawing pictures upon pictures that were Star Wars related. I was in high school when the prequels came out, so my distaste that I have now for them, wasn’t as heightened, as I was just excited to see a new Star Wars movie. I was so excited to have it back, that I would be able to see it in the theater, and didn’t even care that a friend of mine ruined that Darth Maul got cut in half at the end. Then came Episode II, which was the same thing. I was excited to watch my first movie after my mission, which was that one, and Spider-Man. Then came Episode III, which is actually still a pretty okay movie. The jokes and the fun about making fun of the prequels is something that every true Star Wars fan can attest to. It’s something that all true Star Wars fans really love to poke fun at. We love George Lucas for all he gave us with Star Wars, and at the same time hate him for what he did in the prequels. Along came cartoons about the Clone Wars, that were, and still are, amazing. You can imagine how every single year after that, we heard rumor of live action tv shows or possible movies happening, as Mark Hamill wanted to play Luke Skywalker again. Imagine the excitement that hit when Episode VII was announced and was going to be a big screen film. 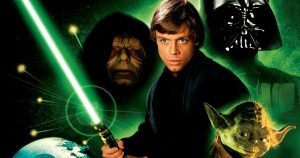 Then came JJ Abrams as the director (who made the brilliant Star Trek films), we then heard that Mark Hamill, Harrison Ford and Carrie Fisher were coming back, and that it was going to take place 30 years after Return of the Jedi. Ensue nerd “fanboying” to the nth! 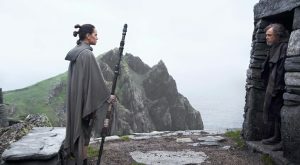 I remember sitting in the theater when the time finally came that I was going to see Episode VII, the word scroll happened and I was audibly freaking out, the moments came with Rey being introduced, along with Finn and Poe, and to see Kylo Ren stopping the laser bolt in mid flight, my mouth dropped. There were so many Star Wars moments, that made Empire Strikes Back so amazing, that were just amazing. Then, entered Han and Chewbacca and the theater cheered and clapped. This would ensue as amazing moment after amazing moment made this the film of the year for that year! As Han died at the hands of his son, their was an audible gasp and many tears and sniffles heard. I have seen this movie around 30 times now.. so, you can imagine my excitement for this December when we will finally be seeing Episode VIII, The Last Jedi. We have seen a few images, have heard a few rumors, some we have found are true, and seen one full trailer. The excitement for who the director is has also propelled my excitement for the movie. Rian Johnson has done some of the most incredible films in the last 15 years, one of which was Looper, which is the greatest time travel film of all time, and a very dark pallet-ed film. He has promised that this will be the Empire Strikes Back of this new trilogy. 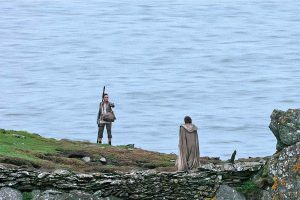 We are going to finally see Luke Skywalker in action, as we only saw him for about one minute at the end of Episode VII, staring down Rey holding his lightsaber. The answers will soon be coming our way! As I get so excited for the new trailer to debut tonight, plus the opportunity to already buy my ticket for the December 14th, Thursday night showing, at Edwards Theater in Ammon, Idaho, I will continue to re watch Episode VII in my excitement towards The Last Jedi. All the rumors, talking with other nerd friends about what is going to happen, or what we think is going to happen, has helped in propelling my excitement forward. There have been a slew of great movies this entire year, but nothing has quelled my pure excitement like it is for The Last Jedi!